An artist's impression of the new Sunway Carnival Mall after the completion of expansion and refurbishment. From left: Sunway Malls & Theme Parks CEO HC Chan, Penang State EXCO for Local Government, Traffic Management and Flood Mitigation Chow Kon Yeow, Penang Chief Minister Lim Guan Eng, Sunway REIT CEO and Sunway Group EXCO Member Datuk Jeffrey Ng Tiong Lip, Seberang Perai Municipal Council's Municipal President Datuk Sr Rozali Mohamud at the groundbreaking ceremony of Sunway Carnival Mall Phase 2. Sunway REIT CEO and Sunway Group EXCO Member Datuk Jeffrey Ng Tiong Lip presenting a souvenir to Penang Chief Minister Lim Guan Eng. 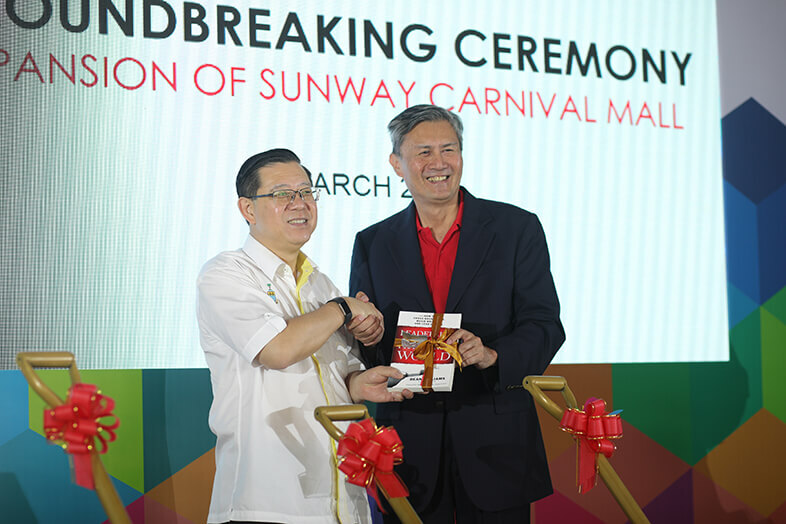 KUALA LUMPUR (March 5): Sunway Carnival Mall, located at Seberang Jaya, Penang, is getting a RM500 million renovation and expansion — a decade after opening its doors. The expansion will see it doubling its gross floor area to 1.45 million sq ft from the current 780,000 sq ft. In a statement, Sunway Group said the expansion is to meet the growing demand for retail space from international retailers as the current mall is close to full occupancy. "With the expansion, the mall will be able to offer a range of international retailers, effectively transforming the retail scene of mainland Penang," it added. The expansion begins now and will be completed in the fourth quarter of 2020. It will bring the mall's net lettable area (NLA) from around 500,000 sq ft to 830,000 sq ft.
Once complete, it will offer 450 retailers from the current 220 across both the new wing and existing wing, with half of the retailers offering fashion, 18% offering food and beverage and 32% in other trade categories. Car park capacity will also increase from 1,100 bays to more than 3,000 bays with the incorporation of brand new upper floors and basement parking. 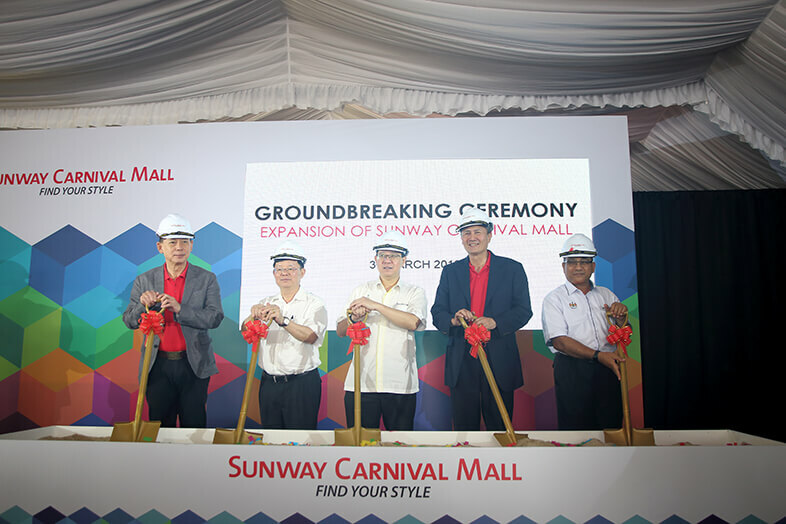 The expansion of Sunway Carnival Mall includes infrastructure and connectivity improvements surrounding the development with seamless connectivity from the Butterworth-Kulim expressway into the mall. This will reach out to a larger market catchment, said Sunway Group. Following the expansion, the first phase of the mall will be undergoing a refurbishment, which is expected to be completed by 2022. "To ensure uniformity, refurbishment will only be carried out on the existing wing once the expansion is completed. This involves the upgrading and re-configuration of interior design and finishing," said Sunway Group. "The total investment for both the expansion and refurbishment will amount to RM500 million," it added. Sunway Carnival Mall, which opened in 2007, is part of Sunway Malls' five retail assets and currently remains as the group's only mall outside of the Klang Valley. The mall welcomes 8 million visitors annually. "Sunway has been part of the Penang community for the last 25 years. Over the years, we are proud to have been given the opportunity to contribute through what we do best — Build-Own-Operate sustainable communities to support Penang's socio-economic growth," Sunway Group founder and chairman Tan Sri Dr Jeffrey Cheah said. "Over the next 10 years, we will be deepening the relationship with Penang's communities through the investment of RM1 billion in the expansion of Sunway Carnival Mall and Sunway Medical Centre in Seberang Jaya," he added. Sunway Group said it also plans to expand its healthcare and education divisions in Penang. The pipeline includes the development of a medical centre in Seberang Jaya and a tertiary education establishment in the state.